The M13 is the high capacity cousin to the venerable current production M8. M is German for "Magazinkapazität" (ma-kah-tsin kah-paht-si-tate) or magazine capacity in English. 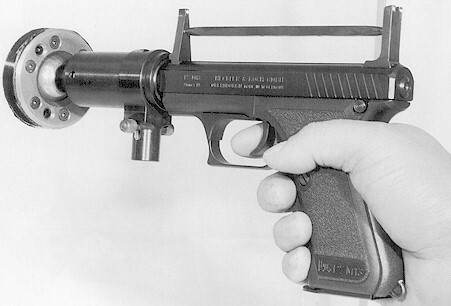 The M13 is still available to the civilian population in other countries including Germany, but is not offered for sale in the United States except to law enforcement and military. 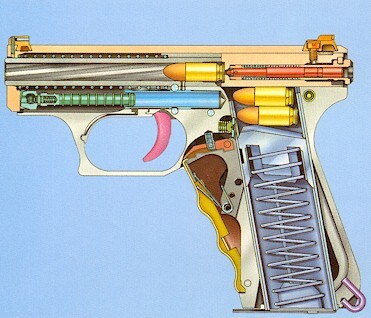 There was no effort on the part of HK to market the gun with 10 round magazines. Probably a wise move, as there would have been no real market for a gun that commands well over $1000 and has a premium price on the existing high capacity magazines. 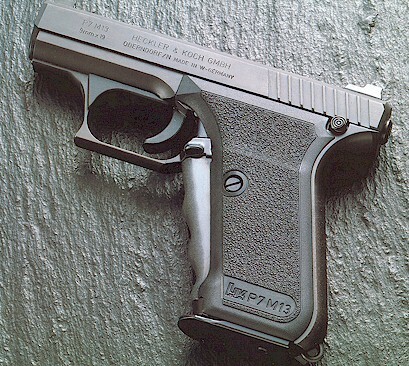 The M13 debuted in 1982 with prototype serial numbers from 001 to 059. Production serial numbers as of January, 1993 run from 71101 M13 to 89600 M13. 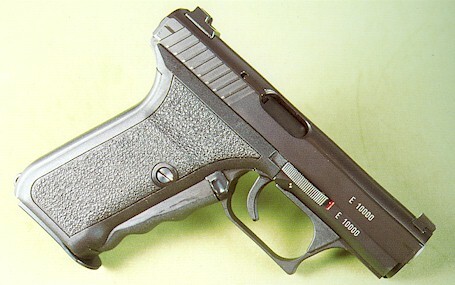 Helmut Welde oversaw this variant as with all P7s. Here's one for the collection--P7M13 serial number 001. There are many interesting variations on the basic P7 theme, especially with respect to the M13 series. Some of these variations are shown below. 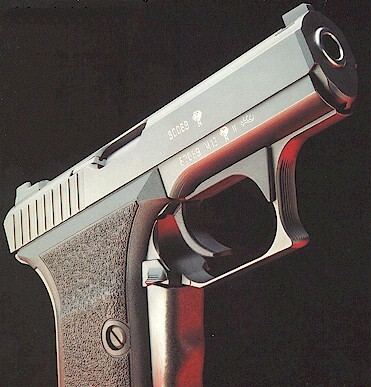 In 1983, the Mexican government expressed interest in the P7M13 pistol for the military but wanted some type of external safety on the gun. With a promise to purchase 3000 units, the M13 was designed with an external sliding safety on the right side of the frame as shown below. Sliding it to the rear revealed a white '0'. Sliding it forward covered the '0' and left the red '1' showing. the 'DIM' on the left grip panel stands for 'Depto. Ind. Mil', as seen on the left side of the slide as well. The number series for this gun was 10000 to 13000. 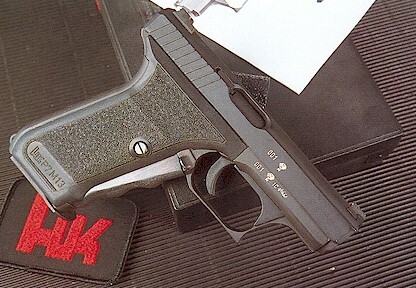 The first production model, serial number 10000, is shown here. 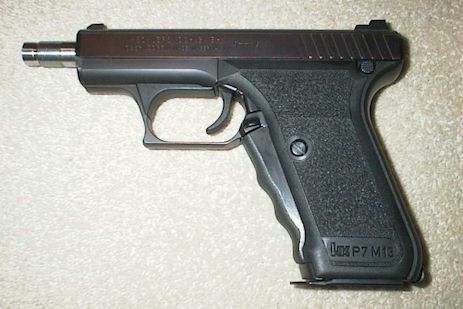 The perfect P7 for when you might have to accurately shoot through your windshield. Special extended sights and barrel extension couple with the windshield component to allow shooting through the glass during those running gunbattles, without one having to hang out the side! 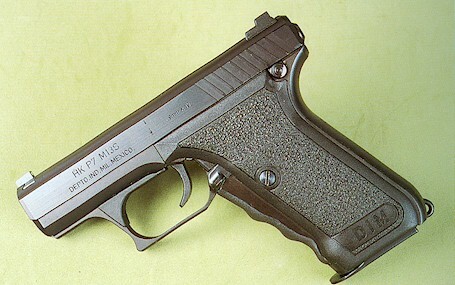 P7M13SD. Extended barrel threaded for sound suppressor, from factory.